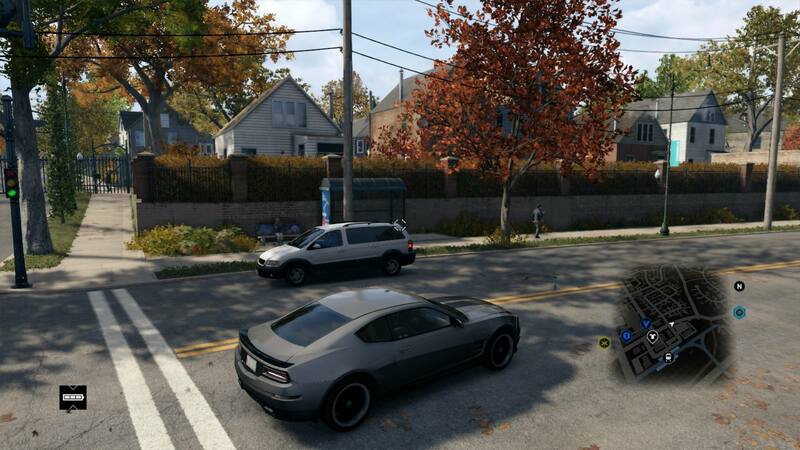 We’re hearing Watch Dogs information from all sides, so today we’ve got a mix for you: more leaked screenshots, but also official information from the Ubisoft blog. 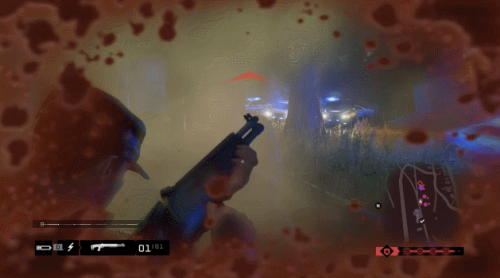 The latest leak comes from a Reddit user who rented the game for the PS4 and uploaded a set of twelve screenshots. 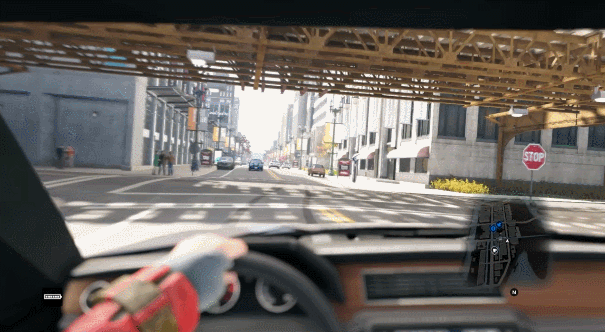 Cars, explosions, NPC information, and more are all featured in these images, and one even appears to show one of the mini-games that startled us when we first caught a glimpse of it in a trailer. 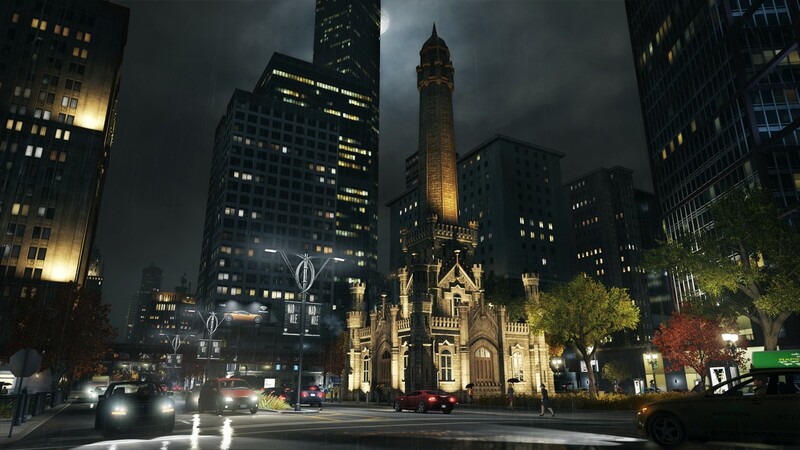 Meanwhile, Ubisoft has provided new information about the factions in the city. You’ll have to deal with DedSec, the Black Viceroys (whom you may remember from a character reveal earlier this month), and the Blume Corporation. DedSec is made up of hackers who sabotage the Central Operating System in an attempt to prove to people that having your entire city controlled by a single system is a bad idea. Aiden could use DedSec’s help, but since he doesn’t actually plan to help them, they don’t all trust him. The Black Viceroys a gang. Their leader is gathering information, and since Aiden wants that information, he’s going to have to get their attention, and we don’t think it’ll lead to a polite conversation over afternoon tea. Finally, there’s the Blume Corporation, which isn’t necessarily evil, but since it has its own hired mercenaries and is gathering personal data about people in the city, maybe something darker is going on behind the scenes. 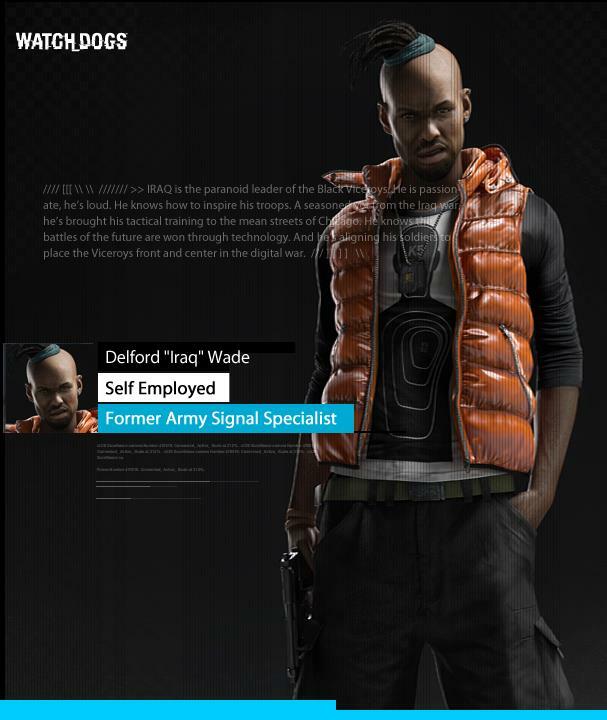 Ubisoft describes DedSec and Blume as being “rather gray” on the morality scale, which might set up the Black Viceroys for more of a straight-up villainous role. Share your thoughts on these three factions in the comments below, and don’t forget to check out the rest of the leaked screenshots. If you’re a little confused about the Watch Dogs videos popping up all across the Internet, there’s probably a good reason for that. We shared some leaked footage a few days ago, but in addition to the early PS4 retail footage, some leaks have also contained lower-quality footage from the PS4 and Xbox One beta versions. 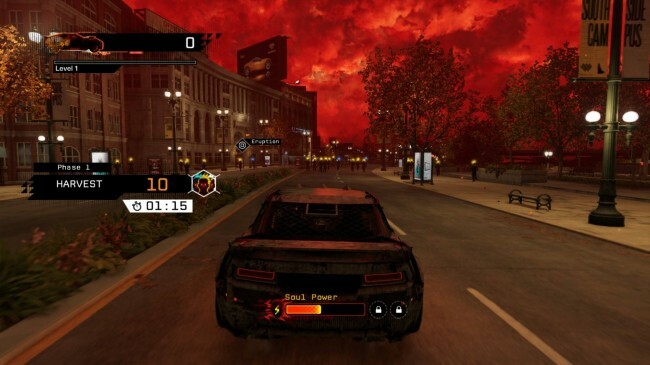 Some players even tried to pass off the beta footage as footage from the final game, which led to Ubisoft warning against fake reviews. We’re more interested in the gameplay, so we’ll share a short Xbox One beta video with you, but keep in mind that this isn’t the finished product. Thoughts? Questions? Share all your impressions in the comments below. Watch Dogs won’t be out until May 27, but it seems as though someone managed to get a PS4 copy of the game already (we haven’t seen any leaks from the Xbox One or other versions yet). Therefore, we’ve gotten to see a plethora of leaked images and gameplay footage. If you want everything to be fresh and new for you when you play the game yourself, you should probably stop reading now. If you’d like to take a look at Watch Dogs, however, read on. The first gameplay videos can be downloaded for slightly better quality. The next is an off-screen recording of a Twitch stream, so it won’t give you the best impression of the way the game looks. But at least you can check out some new gameplay elements not seen in the previous video. The user responsible for the stream posted some additional comments, a high-quality GIF, and a screenshot on the Watch Dogs Forum, as well. He later shared additional animated images. Other screenshots include a couple shots of the map–beware of potential spoilers if you take a closer look. The same source who did the stream of Watch Dogs released two more videos. The second begins the same as the above video, but after four minutes turns over to all new footage. It doesn’t seem as though serious steps are being taken to remove the leaked footage, so enjoy. Once you’ve finished watching, let us know what you think. 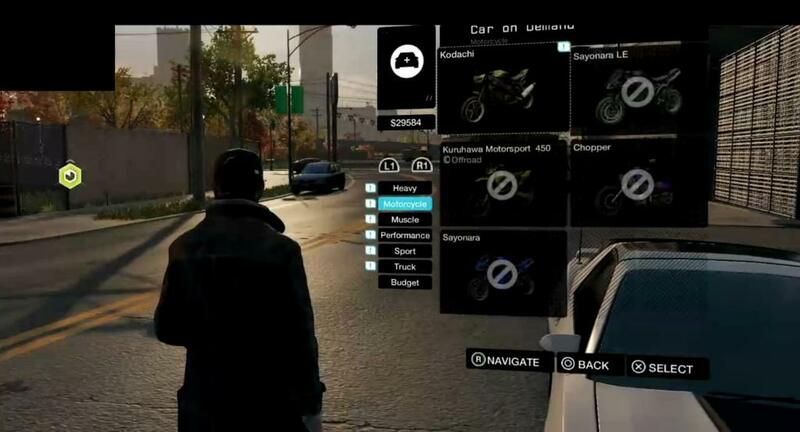 Is a Watch Dogs purchase in your future? Ubisoft’s much-anticipated Watch Dogs, which went gold yesterday and will release for the PS4 and Xbox One (among others) in under two weeks, has received its first television commercial. The CGI commercial sets up the tone and story for the game. Check it out. Are you excited? 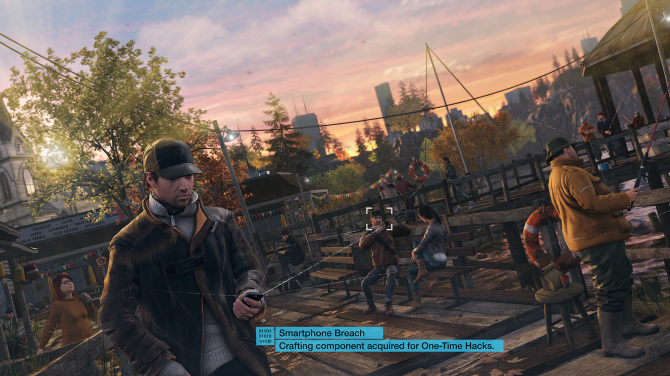 There is still a lot of controversy over the game’s resolution and frame rate, but Creative Director Jonathan Morin has reiterated that this was the best choice for Watch Dogs. We’ll be interested to see how it all works out. We mean it, this time. The past few days have seen a lot of confusion around the frame rate and resolution of Watch Dogs, ever since the PS4 preorder page for the game declared it would run at 60 fps/1080p, quite interesting information that promptly vanished from the page yesterday. Today, Ubisoft cleared up the confusion with the announcement that Watch Dogs will run at 30 fps/900p on the PS4, and 30 fps/792p on the Xbox One. 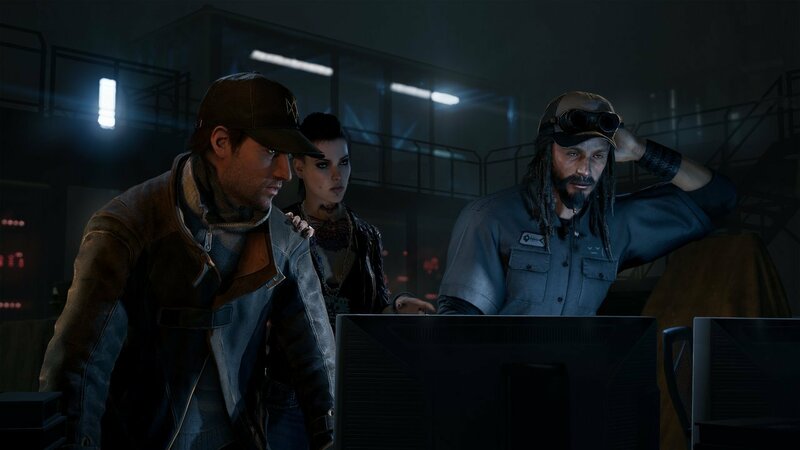 According to Creative Director Jonathan Morin, resolution is not as important as “the soul” of the game, which is why Ubisoft didn’t focus on trying to get Watch Dogs up to 1080p. Many fans are disappointed by these numbers. What do you think? Remember how yesterday we announced that Watch Dogs would run at 60 frames per second with a 1080p resolution on the PS4? Well… it might not. The preorder page looks just as it did yesterday, except the part about the frame rate and resolution is gone. It still says the PS4 version has “the best graphics on any console,” but since the specifics were removed, that probably was an error. We hate to undo news we just announced, but it looks like we’ll have to wait a little longer to learn these details about Watch Dogs. Maybe next time we’ll hear about the Xbox One version, too. Well, we have good news and we have bad news. 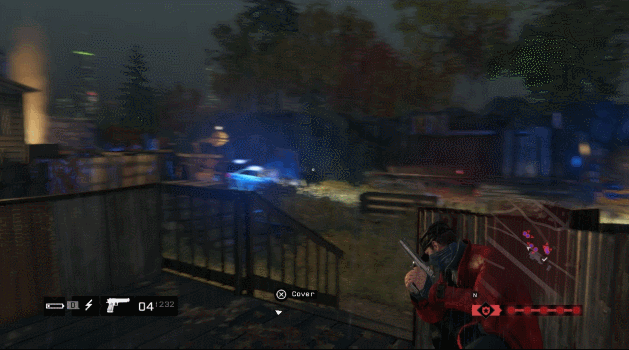 The good news is that Watch Dogs has been confirmed to run at a frame rate of 60 fps, with a 1080p resolution, on the PS4. This information appeared on the North American PS4 preorder page. The bad news is we have no idea what the frame rate and resolution are for the Xbox One version, as its respective preorder page makes no mention of it. Since the PS4 description describe it as “the best graphics on any console,” we can guess the other versions all are lower, but we don’t know the specifics. So far, Ubisoft hasn’t commented. We’ll let you know as soon as we hear more. In the meantime, feel free to discuss frame rate, resolution, and whether or not these things really matter as much as people make them out to. It feels like the release date of Watch Dogs is just around the corner, and we’ve got a lot of good stuff to show you today. Ubisoft started the week by revealing two character profiles. 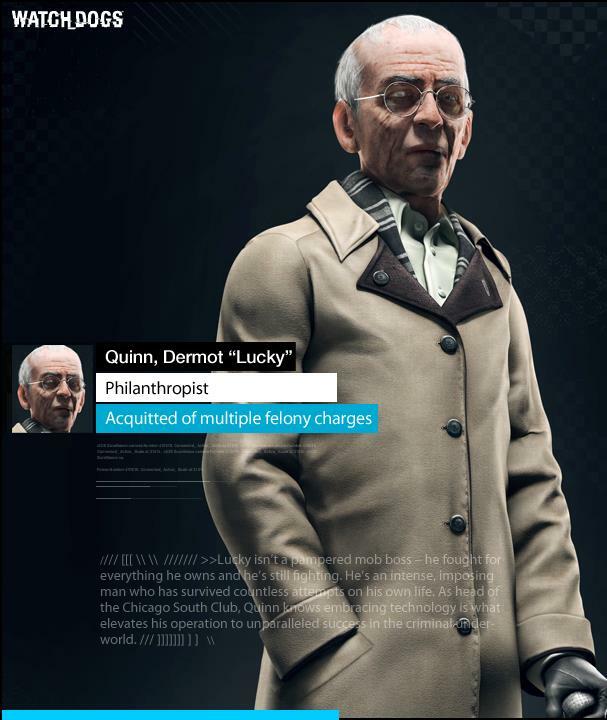 One is Dermot “Lucky” Quinn, a mob boss. The other is Delford “Iraq” Wade, leader of the Black Viceroys. We’ll be interested to see how Aiden interacts with these guys. The new character trailer shows off even more of the people you’ll meet in Watch Dogs. The game is looking pretty well-polished. Share your thoughts in the comments below.